Betrayed by his stepfather, the King, and exiled and sold into slavery because of a forbidden love, Hercules must use his formidable powers to fight his way back to his rightful kingdom. In 2014, moviegoers got two separate Hercules movies – and essentially rejected both. 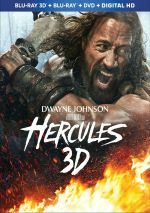 Of the two, July’s Hercules fared better, but given the presence of Dwayne Johnson as the lead and a relatively large budget, its $72 million US made it a definite financial disappointment. At least it easily topped January’s The Legend of Hercules. A slightly less expensive affair, it eschewed big names and completely flopped. With a US gross of $18 million, it bombed – and unlike many films of this sort, its overseas take didn’t salvage it. Like most people, I missed Legend in 2014, so I decided to give it a look on Blu-ray. 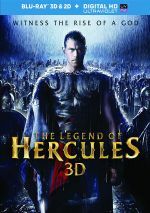 The product of a union between the god Zeus and the human Queen Alcmene (Roxanne McKee), Hercules (Kellan Lutz) doesn’t know of his supernatural lineage. Raised as a prince known as Alcides, Hercules runs afoul of his stepfather, King Amphitryon (Scott Adkins), and finds himself banished because he falls in love with Hebe (Gaia Weiss), a Cretan princess already promised to Prince Iphicles (Liam Garrigan). Sold into slavery, Hercules toils to return to Greece, overcome the king and claim his role as a demi-god. Lutz gained fame in the Twilight, but unlike costars such as Robert Pattinson, Kristen Stewart and Anna Kendrick, he seemed unable to parlay this into greater success. Legend became his best shot at a career as a leading man, but its commercial failure didn’t help him. Well, at least Lutz got a funny cameo on 30 Rock! Based on Legend, though, I can’t claim that Lutz’s stalled career makes me too sad, as the actor fails to show much skill here. With his chiseled physique, Lutz looks right for the part, but he doesn’t demonstrate much in terms of acting ability or charisma. Granted, Hercules isn’t a role that requires Olivier-level range, but it does need someone who can create a convincing hero, and Lutz falls short. He might show the right muscles, but he can’t flesh out the character in the necessary manner. With decades of experience, director Renny Harlin knows his way around an action movie, though I’d be hard-pressed to name a single truly satisfying film of his. Some work better than others, but most seem mediocre at best. Legend falls into that category, as Harlin can’t do anything to bring out the positives within the material. As usual, he creates a loud, flashy action spectacle, but he lacks the talent to form something more dynamic or exciting. All these factors leave Legend as a forgettable exploration of an ancient myth. It might not be a terrible movie, but it isn’t a good one, either. The Legend of Hercules appears in an aspect ratio of approximately 2.40:1 on this Blu-ray Disc. The movie boasted an excellent presentation. Sharpness remained strong at all times. Even wide shots delivered fine clarity and accuracy throughout this vivid image. I saw no jaggies or moiré effects, and the film suffered from neither edge haloes nor source flaws. No one will find surprises with the movie’s amber and teal palette. Within those stylistic constraints, the hues seemed full and well-rendered. Blacks appeared deep and rich, while shadows came across as smooth and clear. I felt wholly pleased with this fine transfer. In addition, the DTS-HD MA 7.1 soundtrack of Legend provided an engulfing experience. With plenty of action on display, the soundscape opened up well and used the various channels in a satisfying manner. This meant good movement around the spectrum, as the components of battle swarmed about us. Music added nice stereo presence, and general atmosphere opened up matters as well. Audio quality appeared top-notch. Music was lively and rich, while speech appeared natural and concise. Effects boasted strong accuracy and punch, with deep low-end. The soundtrack fleshed out the material well. This set includes both 2D and 3D versions of Legend on the same disc. The picture comments above addressed the 2D image – how did the 3D compare? Picture quality seemed similar. Inevitably, the 3D version appeared slightly darker, but not to a problematic degree, and both colors and sharpness held up well. Shot on native stereo cameras, the 3D imaging excelled. The movie demonstrated a terrific sense of depth and immersiveness, with many elements that helped involve the viewer. Floating items spread around the screen in a cool way, which meant material like snow engulfed the viewer in a manner impossible for 2D. A general sense of space also created a realistic impression. Of course, the action scenes offered the showiest scenes, and they added a lot of pizzazz to the proceedings. Spears and swords popped out of the screen, and other information added to the film. Heck, even a fight in murky water showed punch, as the small waves threatened to lap out of the screen. This turned into a highly satisfying 3D presentation that improved over the 2D edition. A couple of supplements appear as well, and we get an audio commentary from director Renny Harlin and actor Kellan Lutz. Both sit together for this running, screen-specific look at action and stunts, cast and performances, story/characters, sets and locations, various effects, music, 3D photography and related areas. A veteran of many commentaries, Harlin shows his comfort with the format, as he provides a chatty, engaging personality. Lutz throws out less information but he still adds his perspective. This adds up to a reasonably useful track. The Making of The Legend of Hercules runs 14 minutes, 46 seconds and offers notes from Harlin, Lutz, stunt coordinator Rowley Irlam, production designer Luca Tranchino, costume designer Sonu Mishra, property master Dirk Buchmann, and actors Liam McIntyre, Scott Adkins, Liam Garrigan, Gaia Weiss, and Roxanne McKee. We learn about story/characters, stunts and action, effects, sets and production design, costumes and weapons, amd 3D photography. Despite a relatively brief running time, “Making” packs a lot of information. While it leans in the director of promotion, it comes with enough useful facts to merit a look. The disc opens with ads for Hunger Games: Catching Fire, Divergent, Ender’s Game and Escape Plan. No trailer for Legend appears here. One might hope to get a fresh new spin on a famous myth via The Legend of Hercules, but one won’t find anything memorable here. Instead, the movie gives us a lot of over the top spectacle with little substance or real excitement. The Blu-ray offers excellent picture and audio along with a well-rendered 3D version and a few supplements. While the movie delivers eye candy – and brings us one of the better 3D presentations I’ve seen – the action rarely entertains.